Click the image above to watch the exercise video! I’m sure you have heard it a million times – if you want to get strong and lean, you should be lifting weights. While it is true that weight lifting is a fantastic way to improve your health and increase lean muscle mass, it certainly is not the only way to do so. It’s also very important to note that if you are just starting out with a new lifestyle and workout goals, it can be very overwhelming to consider investing in a gym membership or weights to workout at home. There is a better, easier and more effective way to get your body moving, without investing significant time or money. That amazing tool is called bodyweight exercises. Your body was meant to move. We are built to use our joints, our muscles, and our nerves to activate motion of our bodies. Evolutionarily, movement allowed us to travel, lift loads, hunt and gather, hike to the tops of mountains, swim to the depths of lakes and the ocean and complete tasks that would allow us to survive and even thrive. Thousands of years ago, we didn’t have dumbells and kettlebells. We had our bodies, and our bodies have mass. In order to build muscle and become leaner, we must use stored fat and sugar as energy to work our bodies against some form of resistance. There is no better resistance in the world than gravity. A great place to start training yourself to use the energy and build a leaner frame is to work your body against gravity with bodyweight exercises. I have put together a simple routine that you can use as a circuit for a basic but highly effective bodyweight training routine, in the comfort of your own home. The great thing about this is that you can start TODAY… no need to hit the gym or purchase expensive equipment – so NO MORE EXCUSES! 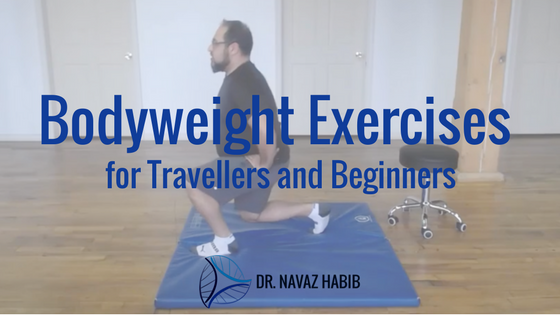 Disclaimer: Speak to your primary health practitioner before beginning any exercise routine and stretch properly before starting this circuit. Stand with your toes pointing slightly outwards. Push your bum out backward and try to reach as far back as possible, as if to sit on a stool/chair behind you. As you work to sit down, extend your arms in front of you to help with balance. Use your buttock muscles (Gluteals) to stand back up. Repeat this 20 times. Lay down on the ground and use your arms and hands to prop up your upper body. Keep your arms/elbows as close to your body as possible. Bend your elbows and bring your chest down as close to the ground as you can. Extend your elbows and push your chest back up, away from the ground until you reach your starting position. Stand up and take a long step forward with one leg. Keep your upper body straight and upright. Bend the front knee to allow your back leg to bend and reach toward the ground. Stop before your back knee reaches the ground. Bring your back knee back to straight and bring your front foot back in line with your back foot at the starting position. Keep your body in a straight line position above the ground by balancing on your elbows/forearms and toes. Contract your core muscles to hold you in that position for 15 seconds. Start standing with hands at your sides. Jump and move your legs away from each other while simultaneously, raising your hands overhead. Bring your hands back down to your sides while you jump and bring your feet back together on the ground.